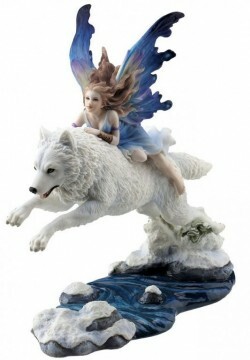 Beautifully detailed figurine portaying a Fairy riding her companion white wolf as it leaps over a stream. Finished with contrasting cool blue tones. Lovely dramatic sculpture. An eye-catching and weighty Fairy solid statue with great detail and design.